I came across this list of 10 Distinctives of Postmodern Churches from Ed Stetzer’s book, Planting New Churches in a Postmodern Age. Be unashamedly spiritual. People are tired of the modern belief that everything can be answered by science and reason. They are open to something mystical and spiritual. Promote incarnational ministry. Authenticity is essential. Postmoderns are looking for persons who are genuine and transparent. 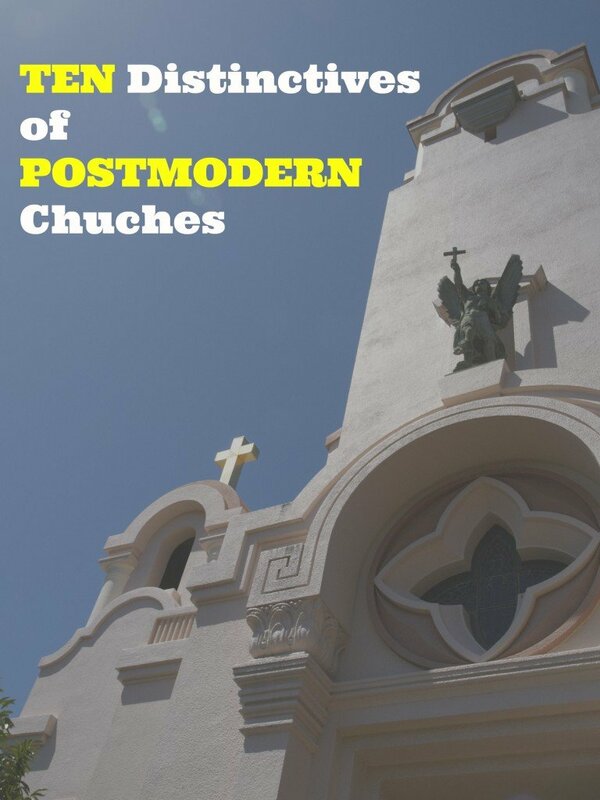 It is not the job of the unchurched postmodern to enter our culture. It is our job to invade theirs (become incarnate) with the unchanging truth of the gospel. Worship experientially. Postmoderns want to experience God, not just see a show about him. A dynamic worshiping community becomes a powerful apologetic to a generation open to the spiritual but not knowing how to connect with the Spirit. Preach narrative expository messages. Jesus frequently used narratives or stories in his preaching, and often the story was the point. Preaching biblical stories connects to a culture that sees stories as a source of truth. Appreciate and participate in ancient patterns. Postmodern leaders are spellbound by the ancient- future faith of the past. There is a new interest in ancient things: Gregorian chants, Celtic Christianity, ancient art, etc. The church can embrace those that promote biblical truth. Experience visual worship. Paintings, banners, candles and other imagery can help share the gospel message. In the postmodern age, truth can be expressed in images illuminating biblical truth. Engage in service. Offer an outlet for their passion to serve. Genuine faith always expresses itself in ministry. As postmoderns see that faith produces service, the validity of the faith is proved. A wonderful outlet for this is to engage postmoderns in mission work. Connect with technology. Churches trying to reach postmoderns not only will use technology in worship, but they also will promote community through that technology. Live community. Community is a central value in most effective churches reaching postmoderns. With a culture eager for genuine community, the Church can offer community with people and with God. Promote team-based leadership. Leadership in the postmodern context tends to be dramatically different than it was in other models. In the modern context, the leader was penalized for transparency. Leaders who shared their struggles frequently regretted it later as it became an example in future arguments. In the postmodern era, struggle and consequently transparency is more valued. Source: Planting New Churches in a Postmodern Age Ed Stetzer. Order your copy from Amazon. Numbers 8, 9, and 10 especially resonate with me — they also happen to be the hallmarks of Web2.0 collaborative technology. Wikipedia is a great example of a community that in many ways resembles a community of faith. And wikipedians are certainly evangelists for their mission. Timely post… We’re discussing emerging church movement in class.